The NDP candidate in North Vancouver is a clown. He is also an alien, an anarchist, a cowboy, an FBI agent and a piano teacher. "I'm not really a doctor," he said, "but I play one on TV." Michael Charrois, a 46-year-old actor, is making his first run for Parliament in a riding in which his party has a long history of failure. The party delayed calling a nomination meeting, hoping perhaps a woman or a member of a visible minority community would be keen to challenge Liberal incumbent Don Bell. Precisely zero candidates stepped forward. Finally, the party's riding executive asked one of their own to put his name forward. He knows only too well the unlikelihood of his name topping the polls. If the NDP wins this riding, it will mean Jack Layton is prime minister, Ottawa has become New Jerusalem, and a democratic socialist utopia will have been established outside of Sweden. So, why campaign when the odds are against you? "Somebody has to wave the flag," he said. "I admire anyone who stands up for what they believe in." Much campaign coverage is about distractions - allegations and insinuations, pooping puffins and Cheech-and-Chong candidacies. Out of the spotlight, candidates hand out pamphlets, knock on doors, bone up on the issues and learn more about their constituents then they ever imagined. The campaign is a 38-day hiatus from everyday life, as 9-to-5 jobs are ignored and family obligations put off. The sacrificial lambs put as much effort into the contest as do candidates with a shot at a seat in Parliament. With cabinet minister David Emerson deciding to retire from electoral politics, Salomon Rayek, the owner of a small business, is carrying the Conservative banner in Vancouver Kingsway. (Mr. Emerson was elected as a Liberal and switched from red to blue after it became clear the Liberals would not be forming a government.) The east-side riding last sent a Tory to Parliament in the John Diefenbaker sweep of 1958. Up in Skeena-Bulkley Valley, Corinna Morhart, a social worker in Prince Rupert, is the Liberal standard-bearer in a riding where the party has placed third in the past two elections. The old Skeena riding last sent a Grit east in 1974, when Iona Campagnolo knocked off an NDP incumbent. Mr. Charrois faces even longer odds. Back in 1935, during the depths of the Depression, voters in North Vancouver elected Grant MacNeil, a wounded First World War veteran and automobile dealer. Three years earlier, he had attended the founding convention of the Co-operative Commonwealth Federation, the NDP's predecessor. How long has it been since the left held the seat? Mr. MacNeil was defeated in 1940 by the future father-in-law of Pierre Trudeau. We're talking history. The last time the NDP came close on the North Shore was in 1965, when a young criminal lawyer named William Deverill placed a distant second in the old Coast-Capilano riding. He had greater success in court and on the bestseller list as the author of mysteries. Mr. Charrois is familiar with lost causes. He ran for the NDP in an Alberta provincial election. In March. "It was dark. Cold. And lonely. I held the vote." He paused. "There was not a lot to hold." With much of the Vancouver film industry based on the North Shore, Mr. Charrois expects to find pockets of support for his criticism of the Conservative government's $45-million cuts in arts funding. He advocates arm's-length funding of the arts. "Nobody in the Prime Minister's Office, or me, should be telling artists what kind of work they should be making," he said. The Conservative candidate in North Vancouver is Andrew Saxton, who is the CEO of an investment firm. The Green Party is running computer consultant Jim Stephenson, whose website states he trained under former U.S. vice-president Al Gore in presenting the Inconvenient Truth slideshow. Mr. Charrois is familiar with bottom lines as a self-employed businessman. He co-produced Orphans, a dark comedy that played at the Firehall Theatre in June to positive reviews. "No grants," he said. "Totally out of pocket. On our own dime. How'd we do financially? Not too well. We lost a little money, but that's the nature of the biz. Thank God I'm in the union. They keep me from giving it away for free." Not that he doesn't know numbers. He read all of John Kenneth Galbraith's works in preparation for portraying the Canadian-born economist in a one-man show featuring comedy, magic and juggling. A descendant of Gaspé fishermen and refugees of the Scottish Highland Clearances, Mr. Charrois became an actor in junior high school. He has been a street performer, a Fringe Festival player and a drama teacher. He portrays an FBI agent in the current X-Files movie, and he spent four hours in a makeup chair being fitted with a hideous mask for The Exorcism of Emily Rose. In the Clint Eastwood movie Unforgiven, he drawls, "They went that a-way." He does have a word of advice for voters. "Better to know you're getting a clown now," he says, "than after they've gone to Ottawa." Ron Lancaster, a son of the Pennsylvania steel mills, came north as a young man to play professional football. He never left, becoming a legend as a player and coach. He wore the jersey of the Rough Riders in Ottawa and the Roughriders in Regina. He was twice named the league's outstanding player and twice named coach of the year. He won four Grey Cup championships – two on the field and two more as a coach. For a time, he worked in the broadcast booth, bringing to a generation of CBC viewers insight into the razzle-dazzle nature of the Canadian game. In Saskatchewan, he will forever be remembered as the quarterback who delivered onto faithful and long-suffering Prairie fans their first football championship. No other title will ever be as sweet as the 1966 triumph. So revered was No. 23 that the team's telephone number remains 306-569-2323, the final digits a tribute to Mr. Lancaster three decades after he last wore the famed green-and-white jersey. He was called the Little General for his diminutive stature and his take-charge attitude. One sports writer nicknamed him “The Blond Boy Gambler.” Some teased by calling him the Leprechaun, or Keebler, after the cookie-baking elves. In his playing days, Mr. Lancaster weighed 175 pounds and stood just 5 foot 9. “And a half,” he would insist. The Little General had greater success than Napoleon in marching his army across the frozen steppes, such as were prairie gridirons in winter. Stumpy in stature, his blond hair worn in a crew cut long after the style fell out of fashion, Mr. Lancaster became the embodiment of football in the wheat province. The elements were a challenge to be endured, the end of a poor campaign regarded the same way a farmer handles a poor harvest – by getting ready for the next season. An elusive runner and a daring passer, Mr. Lancaster seemed to sling the ball rather than throw it. He rewrote the Canadian Football League record book in 19 seasons of dramatic football. He passed for 50,535 yards, which is about two-thirds of the way from Taylor Field in Regina to Moose Jaw city hall. Mr. Lancaster hailed from a small town and played college football in a small town. He felt at home in the Saskatchewan capital, where he also taught high school for seven years. He was born in Fairchance, a hamlet in the heart of the Pennsylvania hill country where coal and coke were king. As a boy, the family moved to Clairton, a hard-scrabble city south of Pittsburgh that would later be the setting for the movie The Deer Hunter. His father, brothers, uncles and cousins laboured in the steel mills and he, too, found summer work there. Clairton was a blue-collar, lunch-bucket town where men worked hard and played harder. The seasons were defined as much by sport as by weather – basketball in winter, baseball in summer, football in fall. The air in the Monongahela River valley was filled with pungent odour of sulphur from the city's coke works. The grimy industrial setting produced steel and football players, the latter the only crop that seemed to take root in soil dusty with residue from the mills. Mike Ditka, Joe Namath and the great Johnny Unitas (five years Mr. Lancaster's senior and his all-time favourite player) all came from the region. The boy witnessed his first football game at 5, cheering for the team of the high school where he soon would become a star. Sports filled the parts of the day not occupied by school. “It was never a problem getting a game,” he once told The Hamilton Spectator. “There was always enough kids. With 70 blocks of houses and six houses to a block in a circle, there was always games going on.” Friday-night high-school games attracted as many as 10,000 customers, with another 1,000 disappointed fans turned away. After graduation, he enrolled at Wittenberg University, a small, liberal arts school at Springfield, Ohio. As a sophomore in 1957, he led the football team to its first Ohio Conference crown since before the Second World War. More importantly, he broke a 29-year jinx by defeating arch-rival Ohio Wesleyan University. The Lutherans' triumph over the Bishops led to much celebration, and Mr. Lancaster's teams posted a 25-8-1 record in his four seasons, as he earned an education degree. Too small to interest the National Football League, and warned away from the fledgling American Football League by his college coach, Mr. Lancaster signed instead with the Ottawa Rough Riders in 1960. Ottawa had another talented young quarterback in Russ Jackson, who is now regarded to have been as the best Canadian-born quarterback in the game. Coach Frank Clair platooned the two pivots, with Mr. Jackson often starting and Mr. Lancaster coming in later in the game. Ottawa won the 1960 Grey Cup over the Edmonton Eskimos at Vancouver in a game best remembered for fans spilling onto the field and tearing down the goal posts with 41 seconds left on the clock. The duelling quarterback tandem created much friction in Ottawa. The Rough Rider brain trust decided to go with Mr. Jackson. 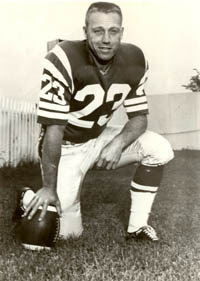 Mr. Lancaster was traded to Saskatchewan before the 1963 season. He would stay with the Roughriders for 16 seasons as a player and two more as a coach. Mr. Lancaster returned to Empire Stadium in Vancouver for the 1966 Grey Cup game against his old team. A gambler at heart, he nearly threw an interception in the second quarter, only to have defensive back Bob O'Billovich deflect the ball through his outstretched hands to Al Ford for a major. The score was tied 14-14 at the half. Saskatchewan's George Reed then ran for a touchdown and Mr. Lancaster completed his third touchdown pass, while the defence shut down Mr. Jackson and the Ottawa offence. The 29-14 victory caused scenes of jubilation in downtown Regina, as well as in one of two locker rooms at Empire Stadium. That glorious triumph was followed by Grey Cup losses for the 'Riders in 1967, 1969, 1972 and 1976. Those defeats led to the joke that in Saskatchewan the wind would blow in spring, summer and winter, while Mr. Lancaster would blow Grey Cup games in the fall. Often self-deprecating and always humble, Mr. Lancaster guided the Roughriders into the playoffs in all but two seasons in which he wore their colours. Mr. Lancaster won the Schenley Award as outstanding player in 1970 and 1976 and was awarded the Jeff Nicklin Memorial Trophy five times as the Western Conference's most valuable player. He was an all-Canadian four times and a Western all-star seven times. He led the league in passing yardage in five seasons. At retirement, he held league records for completed passes (3,384), touchdown passes (333) and yardage (50,535). He also threw 396 interceptions. The CBC assigned him to be a basketball commentator at the 1988 Seoul Olympics. He returned to the sidelines as a coach with Edmonton in 1991, directing the Eskimos to a Grey Cup two years later. He then coached the Hamilton Tiger-Cats from 1998 to 2003, filling in as interim coach midway through the 2006 season. He won his final Grey Cup with the Ticats in 1999. Mr. Lancaster's 142 coaching victories place him fifth on the league's career list. In 2004, he was diagnosed with bladder cancer. In August, he announced the beginning of radiation and chemotherapy treatment for lung cancer. Most recently, he was employed by the Ticats as special adviser of organizational development. He lived in the Hamilton area, a city whose residents he said reminded him of the hard-working people with whom he had grown up. Mr. Lancaster was inducted as player to the Canadian Football Hall of Fame in 1982. He was also a member of Canada's Sports Hall of Fame (1985) and the Saskatchewan Sports Hall of Fame. He was one of 12 charter inductees into the Wittenberg University Athletic Hall of Honour in 1985. Ronald Lancaster was born Oct. 14, 1938, at Fairchance, Pa. He died yesterday of a heart attack. He was 69. He is survived by Beverly, his wife of 50 years, and by his children Lana, Ron, and Bob. He also leaves four grandchildren. Jim Munro’s throne room is an office with a bathroom tucked beside the entrance to the downtown bookstore that carries his name. Munro’s Books is a Government Street landmark, a stopping place for bibliophiles, bureaucrats and cruise ship daytrippers. The store’s neighbours include the 104-year-old Murchie’s tea shop and the 116-year-old Old Morris Tobacconist. The bookstore is a mere pup, celebrating 45 years of pulp peddling this week. Books are stacked on shelves lining the walls of the converted bank, a coffered ceiling overhead. The marble atop the checkout desk is an unused remnant from the construction of the Legislature down the street, salvaged from the former home of the architect Francis Rattenbury. It is a grand space and a wondrous place to browse. Often, one can find the proprietor staggering among the rows with a stack of books. He is responsible for the transportation section, keeps an eye out on shelves dedicated to crafts and economics. He owns the magnificent building, which reduces overhead enough to allow for reasonable salaries and profit sharing. Eight of the 30 workers have been on staff for more than two decades. Back in 1963, Mr. Munro left a steady job at a department store to open his first outlet. His father, a chartered accountant for the same firm, thought him mad. Munro’s the bookstore, like Munro the owner, is a survivor. The final entry in the store’s annual accounts have been in black ink for all but two of the years he has been in business. Munro’s has endured inflation, recession, and a Canadian dollar with a yo-yo value. A giant Chapters store opened nearby. Amazon and other Internet retailers offered books at discount prices. The charmless lures of a big-box retailer and a cyber seller doomed other booksellers in other cities, but they failed to shut Munro’s doors. It is a place to indulge the tactile pleasures of a brick-and-mortar bookstore. The typographical promise of a good dustjacket can be savoured. Passages of prose can be scanned. Knowledgable staff offer tips on titles. Amidst the shelves, one might bump into a literary star, or a politician peddling a memoir. Mr. Munro had romantic notions as a boy, enraptured as he was by tales of the court of Louis XIV. Born and raised in Oakville, Ont., he studied English and history at the University of Western Ontario in London. In the library one day, he gave the eye to a comely co-ed. He was eating Smarties at the same time, dropping one on the floor. Normally, he would have popped it into his mouth, but, not wanting her to think him a grotesque, instead cocked his wrist as to throw the candy in the trash. “I’ll eat it,” she said. They were hushed by the librarian. He called her for a date that night. She did not recognize his name. Mr. Munro wed Alice Laidlaw, They moved to the West Coast, where they would raise three daughters. At Eaton’s, he had success as assistant manager in household linens. He was promoted to fabrics. It was a life of limited possibilities. 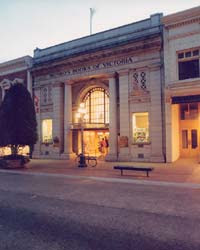 The couple came to Victoria one day, paid admission for their daughters to attend a matinee, and, while the movie played, signed a lease for a nearby retail space on Yates Street across from the public library. They sold $125 worth of paperbacks in their first day. The inexpensive books were seen by more established retailers as being barely reputable, more an impulse purchase at a drug store than the offerings of a literary establishment. Mr. Munro profited from the sale of such pleasures as James Bond books. He became desperate to get copies of “The Spy Who Loved Me,” whose protagonist is an attractive, convent-educated, French-Canadian orphan named Vivienne Michel. The author Ian Fleming, outraged by a poor review published in Montreal, refused to have copies shipped to Canada. Mr. Munro smuggled in a supply from an American wholesaler. The store thrived, though the marriage did not. In 1984, he bought the current location for $360,000. Renovations cost another $150,000. They began tearing down the drop ceiling on Aug. 1 and opened the doors to customers three months later. The street was tougher in those days, including a nearby hotel pub so seedy that the armed forces had declared it off-limits to servicemen. Today, the bookstore is bookended at either end of the block by upscale pubs. The store will be the site of an invitation-only literary costume party on Saturday. The invitation includes a photograph of employee Doug Koch as Shakespeare and store manager Dave Hill as Ernest Hemingway as photographed by Karsh. The owner plans on attending as Prospero. He knows the time for retirement approaches. “I gotta quit soon. You go downhill,” Mr. Munro said. He turns 79 next month. “Our revels are now ended,” he recited. He knows his Shakespeare. He recited some more, before coming to a conclusion. No plans, however, to liberate the wage slaves. Jack McClintock has turned in his badge and his revolver. The long-time police officer is still pounding a beat, only now he's chasing voters, not scofflaws. On Monday, the first day of his retirement, the 54-year-old could be found curbside in the 1100-block of Pandora Avenue. He waved at passing motorists while fellow Conservatives bobbed campaign signs. This low-tech ritual, known as Burma-Shaving after the rhyming signs that once dotted the American landscape, is an inexpensive way to introduce a candidate to the public. It also gives the public a chance to let the candidate know what they think of a) him or her, and b) his or her party. Since Mr. McClintock does not appear on television every day, one presumes the horn-honking and friendly waves, as well as the rude gestures and crude taunts, are directed at the prime minister and the Conservatives. “As a policeman, I've heard it all,” the candidate said. He led a crew fighting a forest fire in northern Manitoba as a summer student (“a huge task and I was a young man, not much past a boy”), has followed trap lines as a conservation officer in Yukon (“district officer for a one-man detachment”) and bought drugs as an undercover cop in Vancouver's Downtown Eastside (“coke, speed, heroin, soft drugs, STP, speed – the works. And guns, too”). As a boy, long before he earned a badge, he got an unforgettable lesson in the consequences of crime. He says it gives him some insight into the lives of homeless youth. Born in Saskatoon, Mr. McClintock was raised in Winnipeg, where he dreamed of being a bush pilot and exploring the vast expanses of the North. He was one of four children (three boys and a girl) of a used-car salesman whose income provided a comfortable life until one terrible day. “Life threw my family a few curve balls,” he said. “My dad got in trouble. He was taken away a year. The family moved into social housing in the north end of Winnipeg. His mother got a waitressing job at a chicken restaurant. The family eventually saved enough money to put a down payment on a wartime house the military called a PMQ (private married quarters). He worked three jobs in his senior year of high school, flipping burgers as a short-order cook at Salisbury House when not pumping gas at one of two stations. He worked in the bush banding Canadian geese before he got enough schooling to become a fish and wildlife officer in Alberta. He worked closely with RCMP officers and decided to become a policeman after spotting a recruitment advertisement in a newspaper. Soon after graduating from police academy, he went undercover as part of a major drug operation in Vancouver. He went unwashed and unshaven to haunts in the Downtown Eastside. In Kitsilano, he cleaned up and dressed “a little more preppy,” visiting the department's property office in search of flashy jewellery. This is his third try for Parliament but the first time his name will appear on the ballot. He lost two earlier nomination battles — for the Canadian Alliance in 2000 and the Conservatives in 2006 — before being acclaimed as the standard-bearer in Victoria 20 months ago. The seat was won two years ago by Denise Savoie of the NDP, a former city councillor who is the early front-runner in this campaign. Liberal candidate Anne Park Shannon is a former assistant deputy minister in the federal Finance Department who headed Canada's delegation to the United Nations Commission on Human Rights. (At her nomination meeting, she told a story about growing up amid a sea of blue lawn signs as the only Liberal family on her Calgary street. Every morning she helped her father re-erect the red lawn sign knocked down overnight.) The Greens are running party activist Adam Saab. Mr. McClintock faces a tough challenge. Victoria, once a Tory bastion, last elected a Conservative member of Parliament 24 years ago. He retired as a corporal with the suburban Central Saanich police, for whom he was a spokesman. He earlier spent nine years on the Vancouver force and 11 with Victoria, as well as five years as a conservation officer in Alberta. The ex-cop is running on a campaign to improve neighbourhood safety. He has been a traffic cop and a media liaison officer. Figures he knows the streets. He also appreciates the circumstances of young people on the street better than they might realize. “I know how critical a stable home is,” he said. The son never asked the father the offence, and the father never told the son. “I left it up to him,” Mr. McClintock said. “It wasn't a violent thing, but nonetheless…” He let the thought trail away. Jube Wickheim's old job was as easy as not falling off a log. Motivation to master the vocation came easily. Mr. Wickheim spent much of his working life as a birler, at first on booms near his home on Vancouver Island and later in competitions that took him around the globe. He won 10 world championships and earned a spot in the Guinness World Records for an incident about which he does not hold fond reminiscence. He is 74 now, long retired from what premier W.A.C. Bennett once officially declared to be the province's official industry sport. Logging sports grew from lumberjacks showing off their skills in competition against other woodsmen. The contestants came from the forests. Nowadays, a handful of professional shows display the venerable skills made redundant by machinery. The sport lives on at logger shows at Gibsons and Campbell River, Sooke and Squamish, and Libby and Darby in Montana. At the Pacific National Exhibition in Vancouver, the West Coast Lumberjack Show put on four performances yesterday at the Spirit Plaza, bringing the hinterland to Playland. Mr. Wickheim wowed crowds at the Vancouver fair for more than a quarter-century in axe-tossing, tree-chopping displays in which fallers and sawyers pay homage to homesteaders like his father. “I doubt there's anybody who grew up in the woods doing it any more,” he said. He is the son of a Norwegian fortune seeker who left the family farm outside Oslo to prospect for gold in the Yukon. His father found only heartache in the Klondike, before settling on a four-acre stump ranch at Saseenos, outside of Victoria. Jubial and his older brother Ardy made money after school and on weekends during the Depression by working on the log booms in Sooke basin. Pushing logs into a mill pond with a pike pole at night without lights turned out to be excellent training for a logroller who did not want to be a log-faller-offer. What's the secret to birling? His single-mindedness was on display when he won his first world championship in 1956. Crowds lined both banks of the fast-flowing Rock River at Rockford, Ill. The duelling birlers stayed upright even as their log caught the current, floated under a bridge and continued downriver until they were out of sight of the spectators. Only his opponent was on hand to see him win. In 1967, he put on four daily shows during Expo 67 in Montreal. The log-rolling was held on Dolphin Lake in the La Ronde amusement park. The Timberland display was sandwiched between the flume ride and Pioneerland with Fort Edmonton, where crowds flocked to the Golden Garter Saloon. Airborne gondolas cruised overhead. He birled at Expo 70 at Osaka, Japan, later performing in Australia, Chile, Romania, and even in his father's homeland. The Wickheim Timber Show became a staple of American summers, also performing at the PNE and at the opening of Euro Disney outside Paris in 1992. 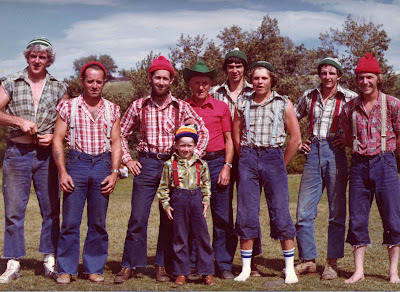 He taught the secrets of the tippy-toe trade to his son, Fred, who performed in a tuque, checked shirt and blue jeans torn below the knee in hillbilly fashion, the pants held up by suspenders. Old Jube is just about the last of his kind. Another of the old-timers, Art Williams, can be found at Likely, the gold-rush town on Quesnel Lake in the Cariboo. For years, he dressed entirely in dark clothes to compete as the Black Knight. He later won fame by donning a wig and a dress as Copper Canyon Sal, whose act included a stunt in which Sal's undergarments slip as a pole is climbed. The climax came when Sal reached the top, where a handstand allowed gravity to return the underwear to its proper place. Accidents were not unknown when cash prizes were on the line in contests such as the underhand chop and the springboard chop. More than just wood fell victim to the axe. “I've seen lots of toes chopped off,” Mr. Wickheim said. “We'd wrap the toe in tissue and send it off to the hospital.” He retired in 1994, all 10 fingers and all 10 toes still attached. After operating it as a Christmas-tree farm, he sold the family homestead four years ago and now lives in Cobble Hill. He spends weeks each summer at a remote cabin in the Chilcotin, where he fishes rainbow trout and hunts for his supper. At last, after two hours, 40 minutes of log-spinning, his legs numb from the exertion, Mr. Wickheim fell in. “I was just so darned hungry,” he said.